March 30, 2012 - Come along on Monday night (April 2) to the next Kingaroy Chamber of Commerce Meet'n'Greet and find out all the changes that are happening at SBBiz and South Burnett Online! The Meet'n'Greet will be held from 5:30pm at the South Burnett Enterprise Centre ... and it's free! As well as hearing from us - Anne Miller and Dafyd Martindale - guests will also have an opportunity to see a presentation from Business Coach and BIEDO Business Pilot Trudi Bartlett. March 30, 2012 - Newly-elected Member for Nanango Deb Frecklington has been appointed Assistant Minister for Finance, Administration and Regulatory Reform in Premier Campbell Newman's new team, announced this afternoon. 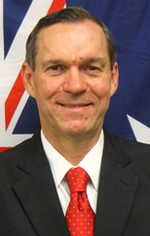 Member for Gympie David Gibson has been appointed Minister for Police and Community Safety. As previously announced, Member for Callide Jeff Seeney is Deputy Premier and Minister for State Development, Infrastructure and Planning. All the newly elected LNP MPs gathered in Brisbane on Wednesday this week for their first post-election gathering. Speaking later, Deb Frecklington said it was very exciting but there was a massive task ahead. "(I'm) looking forward to getting into the hard work," she said. March 29, 2012 - Kingaroy Kitchen has received a $27,000 grant from the Tarong Community Partnership Fund to upgrade its kitchen equipment. The Endeavour Foundation enterprise will use the funding to install a new commercial mixer in the Biscuit Kitchen and two new ovens, one in the Fine Food Kitchen and the other in the Gluten-Free Kitchen. This will allow the group to expand its range of gluten-free products as well as allow for cakes and catering products to be cooked at the same time. An Endeavour spokesman said the new equipment would help increase sales and assist the 27 supported employees. It would also improve the experience for the many tourists who drop into the kitchen every year. "This will, in turn, help to publicise Kingaroy and the whole of the South Burnett region," Kingaroy Kitchen manager Hazel Patterson said. "Endeavour Foundation is extremely grateful to the Tarong Community Partnership Fund and the Stanwell Corporation for this incredible support." 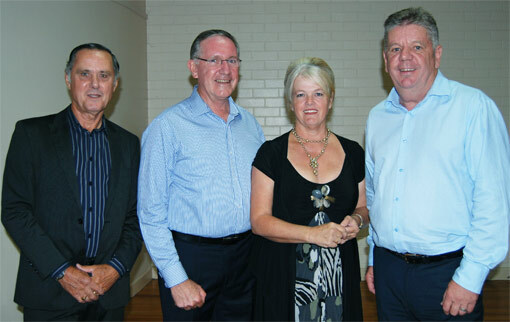 March 28, 2012 - South Burnett Regional Mayor David Carter, (right), contacted SBBiz today to explain why he had decided to withdraw his nomination to run as Mayor at the April 28 election. Cr Carter said that after 18 years in Local Government, he had decided it was time to have a break. "I had put in my nomination form on Monday but when I got out of bed on Tuesday morning I felt that I was not as committed as I should be and withdrew my nomination," he said. "I am emotionally and physically exhausted and don't believe that I have the passion to continue for another four years." A proud Cr Carter reflected on his time with the South Burnett council and his achievements as mayor. "I have worked very hard to make the best of the forced amalgamation for the South Burnett," he said. "I came into Local Government to help people and that has always been my aim as a councillor. Being forced to rationalise rates, impose increased animal registrations and waste levies is not what I call helping people. "Subsidies and assistance to local councils has decreased and having to meet State Government regulations and cost shifting has made it very difficult. And of course this has not been easy to explain to ratepayers. "I am proud of what has been achieved. "The council's financial position has improved dramatically; Yallakool Park on BP Dam has been saved, reopened and is once again being enjoyed by locals and visitors; Coolabunia Saleyards has been maintained and improved; Healthy Communities and Traffic Advisory committees have been instigated and are showing very positive outcomes; after persistent lobbying and mountains of paperwork, the flood reconstruction roadworks have commenced." March 28, 2012 - Kingaroy's stand-alone Medicare office in Kingaroy Shoppingworld will be closing next month. The Federal Government announced yesterday that from April 23 the office would be co-located with Centrelink in Markwell Street. "By the end of 2014, all Centrelink, Medicare and Child Support services will be co-located so Australians everywhere will enjoy the same convenience as people in Kingaroy," Minister for Human Services Senator Kim Carr said. A new credit EFTPOS system will be available at the new location. Customers will be able to swipe their debit cards when a claim is processed and the Medicare rebate will be deposited straight into their bank accounts. The mystery buyer of a 19.83 per cent stake in the Peanut Company of Australia has been revealed as a nominee company, Queen Street Nominees Pty Ltd, although the ultimate beneficial buyer is still unknown. Corporate investor Mariner Corporation secured the PCA holding in February from GPG Nominees, a subsidiary of the Guinness Peat Group, but told the ASX earlier this month that it had now sold it for a $315,000 profit. GPG retained 4.95 per cent but PCA confirmed today this stake has now also been sold, to former PCA Director Ross Burney. In a letter to shareholders, PCA Company Secretary Don Mackenzie said the rapid on-sale by Mariner was consistent with their stated strategy of being an "opportunistic trader". The PCA letter also stated that Queen Street Nominees had paid $475,000 for the PCA shares. 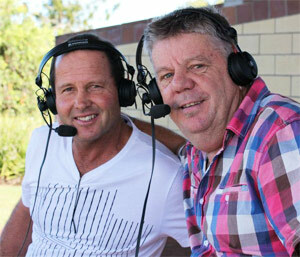 March 27, 2012 - Former CROW-FM breakfast announcer Wayne Kratzmann, (right), was the only name submitted for the role of South Burnett Mayor when nominations closed at noon today for the Local Government elections. This means that Kratzmann, the former Deputy CEO of Wondai Shire Council, will be elected unopposed at the April 28 poll. Current mayor David Carter did not re-nominate for the position and no other nominations were received. Kratzmann told SBBiz he was "excited" by the prospect of becoming Mayor but at the same time a little disappointed that voters would not have the opportunity to express a choice. March 27, 2012 - Ergon Energy is encouraging customers planning to connect solar photovoltaic systems ahead of scheduled reductions in Federal Government incentives on July 1 to submit their application form as soon as possible. "We urge customers planning to purchase a solar PV system before July 1 to promptly fill out and return the application form to us as soon as possible," Ergon General Manager Service Delivery Paul Jordon said. Applications for systems 5kW and greater should be submitted by Monday, April 30. This date also applies for systems 2kW and greater being connected to a single wire earth return (SWER) section of the network, and any systems proposed for any of Ergon Energy's 33 isolated networks. Applications for systems less than 5kW on the main network should be submitted by Monday, May 28. "Every effort will be made to process applications promptly," Mr Jordon said. "However, due to the large volume of applications, Ergon Energy cannot guarantee approval will be granted in time for customers to have their system installed by June 30 to qualify for the higher rebate. "The sooner applications are lodged, the better chance of Ergon Energy processing them in ample time for the PV system to be installed before June 30." Systems with inverters of 5kW or less are eligible for the Queensland Government's Solar Bonus Scheme, provided the customer meets other eligibility criteria. Mr Jordon reminded customers it was their legal obligation to gain approval from Ergon Energy before the system is connected to the electricity network. "In most cases, the installer or PV retailer will manage the application process on behalf of the customer, but it pays to be aware of the process because at the end of the day, it's the customer's signature on the dotted line," he said. Ergon Energy has a dedicated Solar Support Team to help customers and PV retailers. It can be contacted on 1300-553-924. Cougar Energy chief executive Len Walker has told The Australian newspaper that it's too early to tell whether the election of an LNP Government will affect his company's push for $34 million compensation over the Coolabunia UCG project. Cougar shares rose 15 per cent yesterday - off a very low base - but the prices of other UCG companies involved in Queensland projects fell. "The only conclusion to draw is there's no conclusion," Mr Walker said. Rumours are rife this morning that Stanwell CEO Helen Gluer - currently on secondment as Acting Chief Executive Officer of the Health Corporate Services Authority - will be offered a very senior public service position under the new LNP State Government. The Courier-Mail newspaper speculated she could be named Under Treasurer, replacing Gerard Bradley. Helen, former CEO at Tarong Energy, successfully guided the merger of Tarong Energy, the former Stanwell and CS Energy assets into the new Stanwell. Before Tarong Energy, she was Chief Financial Officer at Brisbane City Council. UPDATE 2:00pm: Ms Gluer's appointment as Under Treasurer has been confirmed. Details about the other new State Government appointments can be downloaded here (21kb PDF). Five of the six appointees have links to Brisbane City Council, including Michael Caltabiano who also served as Queensland State President of the Liberal Party from 2003-06. The sixth appointee, David Edwards, is the son of former Liberal Party leader Sir Llew Edwards and worked as Member for Callide Jeff Seeney's chief of staff during his time as Opposition Leader. March 26, 2012 - Land values have not changed in the South and North Burnett areas - with the exception of Monto - according to a report released today by Queensland Valuer-General Neil Bray. The Valuer-General's Property Market Movement Report (1.1MB PDF) summarises Queensland's property market ahead of Wednesday's release of the 2012 annual statutory land valuations. Mr Bray said the report was a snapshot of the 2012 valuation and provided an overview of changes to statutory land values throughout Queensland since the last valuation issued in 2011. Small rural towns in the North and South Burnett have recorded no change to land values overall with the exception of Monto, which recorded a general reduction of 15 per cent. Median land values ranged from $83,000 in Kingaroy to $50,000 at Biggenden and $44,000 at Monto. In the South Burnett, there was no change in the median value of industrial, multi-unit, single unit residential, rural residential or primary production land. Commercial land was down just 1 per cent. "The report covers all market sectors," Mr Bray said. "The property market in Queensland is generally subdued in most market sectors which is reflected in the 2.6 per cent reduction in total valuations. "The exceptions are those areas influenced by the resources boom including the mining, gas, energy and mineral processing industries." Member for Callide Jeff Seeney has been sworn in by Governor Penelope Wensley as Deputy Premier in a ceremony held at Government House this afternoon. Although Cabinet roles have yet to be confirmed, Premier Campbell Newman has previously indicated that Seeney will also serve as Minister for State Development. March 24, 2012 - The blue tsunami which has swept Campbell Newman to power in Queensland also appears to have wiped out high-profile Katter candidate Carl Rackemann's bid for the seat of Nanango. 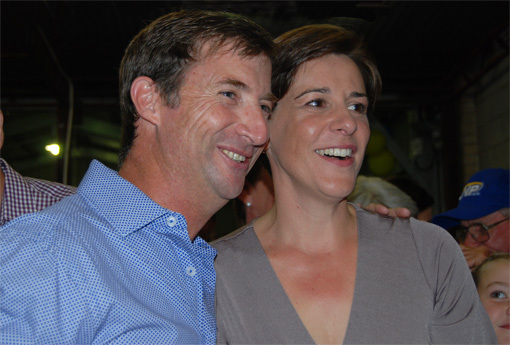 LNP candidate Deb Frecklington, (pictured above with husband Jason), was ahead on primary votes - and also on preferences - as booth counts came through this evening. Retiring Nanango MP Dorothy Pratt's preferred candidate, John Dalton, also polled well, with his preferences appearing to leak to Rackemann. But this was not enough to stop Frecklington from moving ahead. As LNP supporters partied in Kingaroy, KAP supporters must be wondering what went wrong. Nanango was never a critical seat for the LNP but the party worked hard to secure it, with several visits from party leader Campbell Newman and high-profile LNP MPs during the campaign. 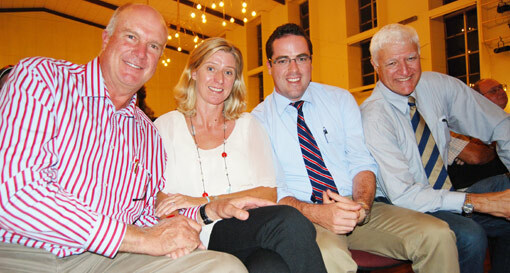 However Nanango was seen by many commentators as a litmus test for the future of Katter's Australian Party. Bob Katter campaigned strongly in the seat and the party had a very high-profile candidate with former Test bowler Carl Rackemann. PS. After all the Bob Katter / Campbell Newman kerfuffle during the campaign, it's interesting to note that the Courier-Mail newspaper reported this morning that Lady Flo Bjelke-Petersen declared she had voted for LNP candidate Deb Frecklington: "It's time for a change, so I voted LNP" she said. 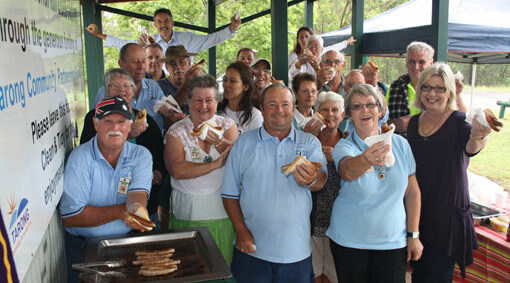 March 23, 2012 - The Blackbutt Benarkin Lions Club, (above), held its first official sausage sizzle recently at its new electric barbecue, picnic table and undercover area in Benarkin Park. The Tarong Community Partnership Fund, established by Tarong and Tarong North power stations and Meandu Mine, contributed $10,000 to the project, which provides a great new facility for locals and people travelling through the region. Tarong Power Station, Meandu Mine and the Kingaroy Local Ambulance Committee have also joined forces to help local ambos deal with impatient babies. Stanwell Corporation, which owns the power station and mine, has provided $5040 for the ambulance committee to buy a birthing trainer, a life-sized model of a mother-to-be - to improve the baby-delivery skills of ambulance paramedics. And their skills are likely to get tested. Did you know South Burnett women have Queensland's second highest fertility rate (2.65 babies per woman) after Mount Isa (2.73)? "This was one of Stanwell's more unusual requests for community funding," Tarong Power Station Site Manager Dennis Franklin said. "However, we are delighted to be part of this great project." Federal Member for Wide Bay Warren Truss will be available for constituent interviews in the South Burnett next Thursday (March 29). "If you are concerned about any area of Federal Government responsibility including Centrelink, Veterans Affairs, immigration, education or taxation, please make an appointment to meet me," Mr Truss said. Appointments are available by telephoning 1300-301-968. The Australian newspaper is reporting today that coal mining magnate Gina Rinehart, who has extensive holdings in Queensland, "took a personal interest" in the purchase last year of the Smart Radio Group by the Macquarie Radio Network. The former Smart Group included a string of stations in regional Queensland, including 4SB (10.71) in Kingaroy. 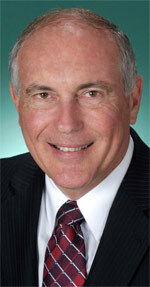 March 22, 2012 - Federal Member for Wide Bay Warren Truss has been the target of much invective by Katter's Australian Party recently over the deregulation of the dairy industry about 12 years ago. Claims by the Federal Member for Kennedy, Mr Bob Katter, which suggest the former Federal Coalition Government deregulated the dairy industry are untrue. The decision to deregulate the dairy industry was made by the Beattie Labor Government. It was impossible for the Australian Government to deregulate the dairy industry as Mr Katter wrongfully suggests because the Australian Government had no dairy regulations to repeal. The Australian Government was concerned about the impact of deregulation on the dairy industry and delivered a $2 billion adjustment package to support dairy farmers. The adjustment package was delivered in response to State Governments deregulating the industry and it is a total nonsense to say it was the other way around. Parliamentary records show that Mr Katter and I have voted in exactly the same way on every piece of legislation relating to the dairy industry that has come before the Australian Parliament. March 22, 2012 - With the Big Red Bus parked in Glendon Street, the "Katter Army" rallied in Kingaroy last night to hear party leader Bob Katter's last major call to arms ahead of Saturday's election. A crowd of 150 in the Kingaroy Town Hall listened to country singer James Blundell,(right) - who sang the Katter Party anthem "Give Bob The Job" and bizarrely, the hippie anthem from another era, Joni Mitchell's "Big Yellow Taxi" (which urges farmers "to put away their DDT now"). Applause began when candidate for Nanango Carl Rackemann and Queensland KAP leader Aidan McLindon entered the hall, and rose to a crescendo when the Man in a Hat himself entered triumphantly. They listened to speeches by KAP spokesman Scott Barrett, Rackemann and McLindon, interspersed with occasional bursts of applause and shouts of "shame". Topics of concern included pork imports, cadmium levels in peanuts, support for country racing and the return of maternity wards to country hospitals. Rackemann explained his reasons for putting up his hand to back Katter: "I want to see our grandchildren eating Australian-grown food, grown by Australian farmers, drinking Australian-produced milk ... and, a novel idea, on Australian-owned farms". Targets for attack included the ALP / LNP and Woolworths / Coles. Especial opprobrium was reserved for Federal National Party politician (and ex-Kingaroy mayor) Warren Truss (over dairy de-regulation 12 years ago) and current and former conservative MPs Peter Costello, Nick Sherry and Mark Vaile (for "selling our farmland overseas"). Promises included the construction of a road linking Kingaroy to the Sunshine Coast and a second range crossing at Toowoomba, the establishment of a State Bank and a State Government Insurance Office, and the scrapping of the Year 7 transition to high school. McLindon called for a round of applause for retiring local MP Dorothy Pratt whom he said had shown great tenacity and guts. He then described the ALP and LNP as "two heads of the same creature" and the LNP as a "very liberal, Liberal party". He criticised the parties' "short-term mindset" and warned that "the bubble of extreme capitalism ... it's inevitable, it will pop". He urged the audience to recruit followers to the KAP cause: "All of you can tell 10 people over the next two days". 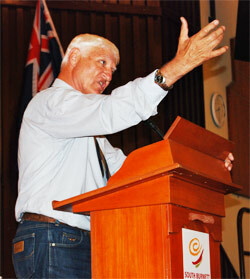 Then it was Bob Katter's turn to take to the podium. 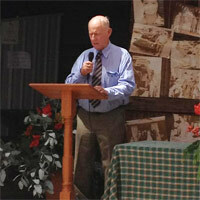 He spoke about coal seam gas and alleged the Chinese Government had hired Australian police to arrest Australian farmers on Australian soil. He said Queensland was fighting a financial war: "They've bought both sides of politics". Katter also criticised the media for their lack of coverage of his party, including the Queensland Country Life newspaper which he described as a "glorified Liberal Party Trading Post if you want to sell a used tractor". Invoking images of Gallipoli and the 49th Battalion in New Guinea, he urged his supporters to take up the fight. "This is the last public forum before E-Day". March 21, 2012 - The South Burnett Regional Council has secured funding from the Blueprint for the Bush scheme for a trial of more transport services in the local region. But they've warned South Burnett residents ... "Use it or lose it!" The trial, held in partnership with local transport operators, will begin next month. "(This) is a great opportunity for South Burnett residents to prove they not only need additional passenger transport services, but they will use them," Council CEO Ken McLoughlin said. "Some of the additional services to be trialled will commence in time for the school holidays and include the extension for the school holidays of Purser's Coaches current morning services from Murgon to Kingaroy and from Blackbutt to Kingaroy with returns. "Additionally, an around Kingaroy service will commence soon and it is also likely that Purser's will extend the morning Kingaroy to Murgon run to Gympie at least three times per week with an afternoon return. "The timetabling will allow connections to bus and trains to the coast and to the north. "Another operator will also operate a minibus from Nanango to Kingaroy each weekday morning and transport to weekend markets across the region will be provided by volunteers driving community-owned vehicles." However Mr McLoughlin stressed that these extra services are trials and if there is any hope to keep them going, they must be used. "To give the community time to adjust to the idea of using passenger transport some of the trials may operate for up to two years but remember: you use it or lose it," he said. "Residents may be surprised to know how much passenger transport already exists in the South Burnett and to ensure residents can find out about what's available Council is launching a page on council's website." March 21, 2012 - Opposition spokesman for agriculture Andrew Cripps says agribusinesses have put their hands up to support the LNP's plans for the industry. An LNP media release today contains supporting comments from Growcom CEO Alex Livingstone, Canegrowers CEO Steve Greenwood, Australian Sugar Milling Council Chairman Quinton Hildebrand and Brett Finlay from AgForce. "Our comprehensive Agriculture Strategy to double production by 2040, and a number of policies to back that strategy have received strong endorsements from peak industry groups during the election campaign, and they are filtering through to the grass roots," Mr Cripps said. "Our policies to undertake the most comprehensive Land Audit ever in Queensland and provide an additional 15 Biosecurity Officers, for example, attracted strong industry interest." You don't have to wait until Saturday to exercise your democratic muscles. Country singer James Blundell will be performing - and, who knows, Bob Katter may well join in - at this evening's free Katter's Australian Party public meeting at Kingaroy Town Hall. The party's Queensland president Aidan McLindon will also be in attendance, alongside local party candidate Carl Rackemann. The ALP today promised to spend more than $900,000 upgrading the D'Aguilar Highway between Caboolture and Kilcoy if it is re-elected at Saturday's poll. On March 1, LNP leader Campbell Newman announced in Kingaroy that if elected, he would spend $10 million to build passing lanes between Blackbutt and Nanango and between Harlin and Toogoolawah. Now Katter's Australian Party Glass House candidate Peter Harris says his party will transform the D'Aguilar Highway into a 125km/h "super highway"'. But as today's Courier-Mail notes, Mr Harris could not say how many lanes such a road would have or how much it would cost. A Big Achievement For Local Bendigo Team! March 20, 2012 - A contingent from the South Burnett Community Enterprises Financial Services Limited, which operates the local Yarraman Community Bank and Blackbutt branch of Bendigo Bank, travelled to Far North Queensland recently to attend the annual Community Bank State Conference. 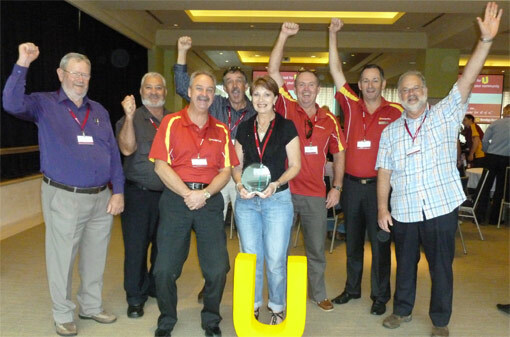 Branch Manager Anne Woodrow was ecstatic that the local branch was not only nominated but won the 2012 Queensland Achievement Award. This award recognises the significant achievement in business growth and profitability while engaging and assisting local youth. South Burnett Community Enterprises Limited says it has always been at the forefront of director education, to help the future capacity of their community and developing significant relationships with government. March 19, 2012 - Controversial Federal MP Bob Katter is returning to Kingaroy on Wednesday to host a free public meeting from 7:00pm at Kingaroy Town Hall. A press release from his Katter's Australian Party today invited "everyone from the community" to hear Bob Katter and local candidate Carl Rackemann explain their vision and get a chance to ask questions. Meanwhile, the party today advised voters that the "Katter Army" could now "vote in confidence" because the ALP era was over in Queensland. "We announce today unequivocally that Katter's Australian Party will not support a Labor Government after the election," Mr Katter said. "Today marks the end of the Bligh Labor era and on Saturday all Queenslanders will have the opportunity to get rid of Bligh's Labor policies. It is clear Queenslanders are taking a baseball bat with them to the polling booth and Labor's time is up but I plead with them to think about the government they are going to install." The finally party ruled out supporting the ALP after polling showed the Labor vote had collapsed. Katter's Australian Party candidate Carl Rackemann told The Australian newspaper recently, (see story below) that he had not experienced any local backlash over his party's anti-gay marriage TV ad. "The first time I saw that ad on TV, I was so shocked that anything like it was even allowed on TV, that would single out a people group in such a volatile way. Those visuals were a deliberate attack on gay people, used simply to incite hatred (by) the anti-gay movement which seems to exist in such a stronghold in this region. "I listened on Sunday to a harrowing documentary on the ABC about the genocide in Bosnia 20 years ago and it featured painful interviews with soldiers from the conflict and survivors. "Has it not occurred to you that this kind of advertising simply incites and encourages hatred of people - groups who are different from oneself? We seem to live in a region of particularly shallow thinkers, homophobes and those clearly bordering on religious extremism. "Can we not learn the lessons from places like Bosnia, Rwanda (and) Germany in WWII?" Polly urged Carl and the Katter party to "take responsibility for your actions" and immediately "stop this kind of publicity, renouncing any affiliation with homophobes". "I myself am a Christian but understand that married couples have civil advantages over gay couples. It seems to me that the issue at stake is a civil one and relates to human rights and should be debated as such," she said. She said politicians should "leave the spiritual high ground to spiritual leaders" and focus on what they can do for a community as opposed to inciting hatred. 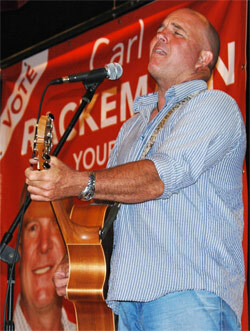 Mr Rackemann, I hope there is a backlash in the Nanango electorate and everywhere else KAP is standing a candidate. Mr Katter's policies may have some credibility - heaven knows we need something better in rural areas than we have had. But to encourage and harness bigotry and hatred in others is shameful and has no rightful place in any religion. Mr Rackemann, do you profess to be a person capable of leading our district in a just and honourable way? Retiring Member for Nanango Dorothy "Dolly" Pratt was honoured at a function organised by friends at Kingaroy RSL Club on Friday evening. Dorothy was elected in 1998 as the One Nation representative for Barambah but soon left the party and remained in State Parliament as an Independent MP. In 2001, Barambah was abolished and replaced by the seat of Nanango which Dorothy continued to hold as an Independent. She announced last year that she would not be re-contesting Nanango at the upcoming State election. About 60 people attended her farewell. Dorothy reflected on her 14 years in Parliament. Speeches were given by Don Davey, president of the South Burnett Vietnam Veterans Association (of which Dorothy is Patron), Cr Keith Campbell and former Wondai Shire Deputy CEO Wayne Kratzmann. Earlier in the day, Wayne Kratzmann, (pictured at right with sports guru Russell "Skippy" Exelby), was also farewelled by CROW-FM fans after 14 years at the radio station. 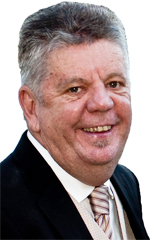 Wayne has resigned as breakfast announcer and General Manager of the station to contest the Mayoral position of the South Burnett Regional Council at the upcoming Local Government elections. CROW-FM marked the occasion with a special outside broadcast in Coronation Park at Wondai which was attended by a large crowd. John Box, from the CROW-FM Board, presented Kratzie with a Life Membership of the station to mark the occasion. Chris "Corky" Corcoran has been appointed the new CROW-FM General Manager. Katter's Australian Party candidate for Nanango, Carl Rackemann, has told The Australian newspaper he has not experienced any backlash over the party's anti-gay marriage advertisement. "The position of the party and me personally is pretty straight-forward: marriage is between a man and a woman," Mr Rackemann said. ALP candidate for Nanango Virginia Clarke has criticised the LNP's plan to scrap the commercial Waste Levy, saying it is a short-sighted policy. "This will significantly set back efforts to reduce the substantial environmental and economic costs of waste management," she said. She said the promise would also seriously hamper the growth of waste recycling businesses. "Businesses need to be encouraged to get their waste recycled rather than sending their rubbish to the dump and imposing costs on the average taxpayer," she said. "Labor's waste levy is encouraging the development of new recycling businesses which creates new jobs and wealth and also reduces the demand for landfill sites and their associated costs." March 16, 2012 - Corporate investor Mariner Corporation, who purchased a 19.83% majority shareholding in the Kingaroy-based Peanut Company of Australia earlier this year, has now sold off its shares. Back in February, Mariner paid $3.2 million to the Guinness Peat Group for stakes in four food companies - Farm Pride Foods, Tasmanian Pure Foods, PCA and Capilano Honey. Tasmanian Pure Foods, which operated a cannery, was immediately on-sold for $850,000. The Australian newspaper reported today that Mariner has now sold its stake in PCA and in Victorian egg producer Farm Pride Foods. These two sales have reportedly netted Mariner almost a $515,000 profit, including $315,000 from PCA. There is no word at present as to who has purchased the PCA shareholding. Ringsfield House at Nanango hosted a special celebration today to mark the official naming of the Pat Lee Meeting Room in the Old School building in the grounds. Betty Elaine (Pat) Lee, of 'Broadmere', Nanango was a very active member of the Nanango community, a member of the Nanango Historical Society and a Life Member of the Glengallan Homestead Trust. She died on February 18 last year, aged 80. March 16, 2012 - Katter's Australian Party candidate for Nanango Carl Rackemann has contacted SBBiz to to say how appalled he is over a report on Today Tonight this week that detailed the sale of a Victorian State Government dairy research farm at Kyabram to a Chinese investor and the alleged "spruiking" of Australian farms overseas by former politicians. "If this story is true, it seems the dots are finally starting to get joined up. How can this be going on? What is the agenda?" Carl asked. "Why are the Liberal Party, the Labor Party and the National Party all in on it? Katter's Australian Party is appalled by this revelation. "If the aim is to sell off Australia then let's get on with it. It is not the aim of Katter's Australian Party. "I cannot believe this is being allowed to happen. Our party will cap foreign ownership of land at 49 per cent per title. "I would recommend having a look at our policy document 'Re-constructing Queensland' and at our agriculture policy 'Returning Confidence To Food and Agriculture'. "We cannot accept our farmland being sold off to foreign companies and foreign governments. Our farm land is being sacrificed, but why? I want our grandchildren to be eating Australian-grown food and drinking Australian-produced milk." Greens candidate for Nanango Grant Newson has criticised an LNP promise to put a three-year freeze on registration fees for family vehicles, saying it will hurt farmers. Motorcyclists, truck and ute drivers are expected to pay more in registration fees to help fund the LNP promise. "Every farmer has either a ute, truck or motorbike, if not all of them to help with rural life and farm work," Mr Newson said. "People are fed up with paying more for everything and receiving nothing in return, especially when these vehicles are needed for normal rural living. "Rural residents and farmers are already doing it hard enough through bad management from the current government. Slugging them for extra money from vehicles that are an essential part of farming life is not going to help." The date for the annual Colours of Yarraman festival has been changed again. The October date clashed with a neighbouring festival. This year's event will also include a major sports carnival. March 15, 2012 - Unemployment in the Wide Bay region has continued to rise - hitting 8.5 per cent in February. Federal Member for Wide Bay Warren Truss said today the jump demanded immediate action from all levels of government. "The unemployment rate in our region has been volatile, reaching a peak of 12.3 per cent in August last year before dropping to 5.3 per cent in November," Mr Truss said. "The sharp rise to 7.5 per cent in January, to 8.5 per cent in February, indicates that action is needed to create jobs and strengthen the regional economy." Mr Truss said the State and Federal ALP governments had broken their promises to create new jobs. "The Bligh Labor Government could have created countless jobs in Maryborough by awarding its multi-billion dollar train project to local manufacturer Downer EDI instead of inviting offshore contractors to tender and create jobs in Asia," Mr Truss said.